Here’s a Frye anecdote it’s never occurred to me to relate here before. I took his undergrad Shakespeare course, which he taught that year with Julian Patrick. The arrangement was that they would each give a one hour lecture per week, the third hour reserved for tutorials. Each also attended the other’s lectures. As the end of the second term approached, Patrick made reference to the fact that our final exam was to be April 23rd. “Shakespeare’s birthday,” he said encouragingly. Frye piped up: “Also the day he died,” which brought a roar of laughter from the class of about two hundred students. I’m glad to say we gave him a sustained round of applause at the end of his last lecture, which, as he left the stage, he paused to acknowledge with a small but pleased smile. This entry was posted in Memoir, Shakespeare on April 23, 2011 by Michael Happy. To celebrate Shakespeare’s 447th birthday, here’s Al Pacino’s excellent film about putting together a production of Richard III, Looking for Richard. Treat yourself: watch this. It’s very lively, and the performances are wonderful. As a bonus, there are French subtitles. This entry was posted in Saturday Night, Shakespeare on April 23, 2011 by Michael Happy. Today is the anniversary of both Shakespeare‘s birth (traditionally ascribed to this date) and his death: 1564-1616. If we decide to observe this anniversary here every year, we’ve got lots to work with because the new Collected Works volume of Frye on Shakespeare is now out. 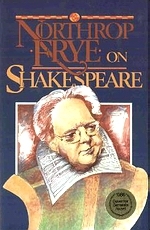 Frye produced more essays and books on Shakespeare than on any other writer, Blake included. The reasons don’t need to be guessed at. Shakespeare’s is a comprehensive literary imagination, and the four traditional dramatic genres — comedy, tragedy, history, and romance — are (if we take the history plays to be a form of irony-satire) expressions of the four mythoi laid out in Anatomy. The two were made for each other. Now that we seem to be outgrowing the cramped restrictions of the literary criticism of the last thirty years, it’s easier to talk openly again about an imagination so vast that it is difficult to conceive of any boundary to it. Shakespeare’s global appeal is perhaps the best evidence there is of imaginative constants common to all people and all cultures — a universality recognizable as shared human desires and expectations whose imaginative dimension is always available to be explored. Shakespeare’s articulation of them as archetypal concerns is, of course, also a matter of poetry so fully realized that it cannot be entirely lost in translation. His wide appeal seems to be that he not only brings out the best in the English language, but also the best in any language that makes his work part of its own. We can begin just about anywhere when it comes to Frye on Shakespeare. It’s always easy, for example, to be drawn to the way he consistently pushes aside our reflexive instincts to engage in biographical fallacy, especially when confronted with genius this expansive. It’s not that Shakespeare doesn’t have a biography that might in some way on some occasions be relevant to the work. It’s that Shakespeare’s literary power far exceeds any biographical consideration. The reductive nature of much Shakespearean critical biography ends up as an embarrassment. As Frye says, when a literary critic takes on Shakespeare, it is the critic and not Shakespeare who is being judged. His unique contribution to Shakespeare scholarship is crediting the independent authority that the literary work itself always possesses, even if that authority is only imperfectly understood. The single biographical detail that gives me a thrill is the coincidence of a life beginning and ending on the same date. It means nothing as a matter of historical fact, but it does suggest that when those arbitrary dates are superstitiously aligned, our notions of life and death may cancel one another out, leaving behind an imaginative perspective that encompasses both. And that is something that is always relevant to Shakespeare. This entry was posted in Anniversaries, Shakespeare on April 23, 2011 by Michael Happy.